PeopleFluent Mirror Suite is a cloud-based talent management suite that includes modules for: Recruiting, Performance Management, Compensation Planning, Employee Learning, Succession Planning, Workforce Planning, Diversity, and even Vendor Management. PeopleFluent software is designed to address critical, talent-related challenges such as performance issues, high turnover, talent retention, and overall employee engagement. Through integrated video, strategic analytics, and collaborative social technologies, PeopleFluent’s Mirror Suite for Talent Management is redefining the talent acquisition and talent management experience. From attracting and retaining talent, to pay-for-performance and greater talent development, the PeopleFluent Mirror Suite helps its users gain deep talent insights to support informed, strategic decisions that drive optimal business outcomes. Additionally, PeopleFluent can coexist and integrate with virtually any core HR or Human Capital Management system, thanks to its Data Integration managed service solution. We recommend PeopleFluent’s Mirror Suite to companies looking for a talent management system that offers deeper functionality than most, but without the core HR and payroll functions, so they may leverage their existing investments. It’s an especially good fit for large enterprises, training companies, and recruiting agencies. 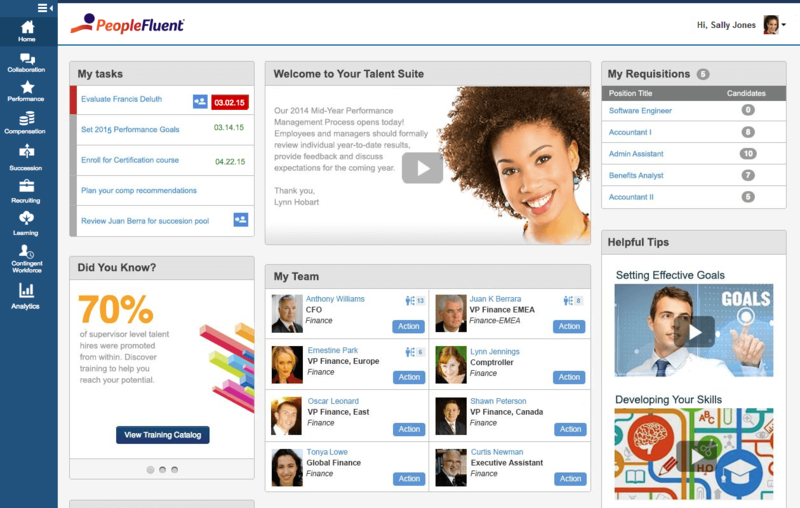 Not sure if PeopleFluent Mirror Suite is the right talent management solution for your business? Call, click, or email to speak with an unbiased Technology Advisor for a no-cost, no-obligation consultation on your unique requirements. Learn everything you need to know about PeopleFluent Mirror Suite for Talent Management. Our experts will reach out to you shortly.